Wired4Music is the network for 16-25 years olds all interested in music and living in London, hosted by Sound Connections. Members can sign up quickly and easily via the Wired4Music website, and the Sound Connections team work closely with these individuals and groups to empower their music projects and ideas. A great deal of our work with Wired4Music members is interpersonal, including one-to-one mentoring sessions and conversations that get right into the nitty-gritty of individual funding applications or project ideas. We also offer career guidance to those wanting to develop further within the music industry more broadly. Our engagement is detailed, long-term and pastoral, and we have seen the impact that our work has had on Wired4Music members and their development over our past seven years of work in this area. As an organisation our ongoing aim is to continually strengthen our outcomes and evidence framework, in order to prove that working in the nuanced ways we do has a direct, sustainable and positive impact on the people we work with. Through quantitative analysis of the opportunities presented to Wired4Music members across 2016/2017 we were able to demonstrate that from direct work with over forty core Wired4Music members engaged with major projects, this cohort additionally recruited over 100 Wired4Music peers, providing paid work opportunities within member-led projects. During 2016/2017 Wired4Music in-house activity and projects engaged a total of 262 participants, resulting in members of the network accessing 755 paid working hours in the music sector. 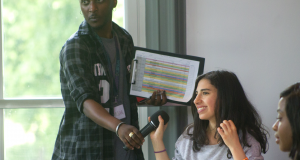 Our engagement with active members has involved an additional 458 hours of youth voice practice, including one to ones, roundtables, consultations and training, providing practical and pastoral support for Londoners from all backgrounds. We have started to build a rich picture of the individuals we are reaching by proxy, ranging from one time event attendees to week long workshop participants. Overall we know that out of 761 Wired4Music members, the most common type of engagement with members is through the Wired4Music website. Young people tell us that they check the Wired4Music daily for new listings, and we have more opportunity listings than ever before. During 2016/2017 we shared a total of 413 vacancy opportunities made known to us by Sound Connections partners and other music organisations. We currently have 22 paid employment opportunities available for young people to access on the Wired4Music website. Over the same period the Wired4Music Jobs & Internships website page had 23,255 page views, and the Opportunities & Events page had 24,289 page views. A collective comparison of both pages compared to 2015/2016 demonstrates a percentage increase over of 166% more people engaging with paid jobs and opportunities hand-picked for young people in the music sector, and made accessible via Wired4Music. Through dialogue with Wired4Music members, we understand that these jobs and opportunities are enabling young people to increase their knowledge of the music sector by providing opportunities for real-world engagement in paid work. If you would like to find out more about the methods we use to demonstrate the impact of our work with young people, please contact daisy@sound-connections.org.uk.